When booking on the B&B Ireland site there are No Booking Fees. This means you can reserve as many B&Bs as you like and pay No Booking Fees! NOTE: (Affiliate Bookings/Booking Form Bookings – If you begin your booking journey from a booking engine/booking form on an external site rather than a search on B&B Ireland there is a small booking fee of €2.50+VAT. No commission is paid in the case of an Affiliate Booking. If you cancel within 48 hours of arrival or fail to show up, 100% of the first nights’ accommodation fee will be charged to your credit card. A non-refundable 12% or 14% deposit depending on B&B booked will be deducted from your credit card at the time of booking. This is to secure the booking. The balance is then payable to your host/B&B, this is payable on arrival or departure at the B&B. All properties offer a live booking facility. You will receive an instant confirmation. The non-refundable 12% or 14% deposit will be charged to your credit card. The balance is payable to your host on departure. Many homes offer a reduction for children under 12, this normally applies when children share with parents. Look for the child reduction symbol. Check in time is 3PM to 6PM. If you are arriving at the accommodation outside of these times, please notify the home directly using the contact details in your booking confirmation email. Some homes may contact you via e-mail or telephone in advance of your arrival date to request an approximate arrival time. To cancel or amend a booking, please log in to your account that was created at the time of booking. As above, the cancellation policy of 48 hours’ notice applies. From your account, you can cancel your booking and rebook another property or date. 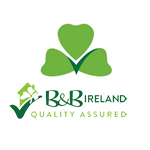 If you are experiencing difficulty or have an amendment that can’t be carried out through your account please e-mail your details to reservations@bandbireland.com and a member of B&B Ireland staff will assist you. Please Note: Some B&B Operators may charge a fee when you use your credit card to pay for accommodation.